It’s great that you have decided to finally try out kayaking! Congratulations, you’re now on the verge of diving into a whole new type of adventure. Kayaking is surely fun, but fishing on a kayak is even more fun. Kayak fishing is an extremely popular activity among the holidaymakers from all corners of the world. Kayaks can be rented out in certain fishing spots, but that won’t provide you with an amazing experience. If you want the real deal, you need to have a good quality kayak and actually set out to the rivers or seas for a few days. Get familiar with the geography of the region and where fish are more available, cast out your rod and start fishing. Although it sounds simple, it actually isn’t. You’ll need kayak fishing accessories and gears that will help you catch fish without breaking a sweat, under the scorching sun. You are probably familiar with some of these but some are more unheard of. This guide will help you understand what kind of kayak fishing accessories you will need for a successful and memorable fishing trip. You’ll need anchor kits that include the main anchor (which resembles a grappling hook), reel, float, buoy, zig zag cleat, and fittings. Go for a small anchor that you can carry in the small space of your kayak. Usually, the reel comes with a nylon line ranging from 50 to 100 meters. Depending on the depth of the water, use the right length of the line and attach it to the anchor. Then attach the float at the other end of the line. When the anchor is dumped into the water, the float will allow you to know where the location of the anchor is so you can retrieve it later. Now throw the anchor into the sea gently and wait for it to sink until it reaches the bottom. Use the zig zag cleat to attach your end of the nylon line to the kayak bow or stern. If you know the essential rules for kayaking, you definitely understand the importance of a cool. You’ll get to know how important it is to have on board when you will actually have it on board. Suppose you have caught a large amount of game fish, but where would you keep them? The fish would produce a rotten smell if you are unable to store them and you would not feel like eating these anymore. How would you carry your fish back home? Of course, you will have to do that using a portable cooler. A cooler is simply indispensable if you’re packing for a fishing trip with a few other people. You can store water, food and drinks inside the cooler. Imagine how fun it would be if you could have a cold beer in the middle of the sea! However, most importantly, you can store water in the cooler. Since you’re spending hours in the sun hunting for fish, you’ll get dehydrated very easily. There are two kinds of coolers. You can either pick a cooler bag or a cooler box. The bags are more versatile. You can use cooler bags to pack food and drinks very easily. Some come in backpack forms, which means you can use them for kayaking and other activities as well. Some bags are waterproof. In the waterproof bags you can keep your fishing license, phones and other small objects that can get damaged due to water splash. The box type coolers, on the other hand, are rigid and last longer. So you should use one for camping trips or long kayaking trips. Rod holders are important! You don’t want rods on the kayak floor, as this could damage the rod and make your seating highly uncomfortable. You’ll see avid fishermen having three or more rod holders installed on board. Having spare rods is definitely a good idea. Taking more crew members and more rods will allow you to set a bunch of rods all at once. You could even hold competitions with your kayak mates on the best fishing spots in the USA and see who catches more fish in the least amount of time. Usually, you’ll have to drill holes into the kayak to place rod holders; but some kayaks come with built-in rod holders. It is best to set your own rod holders on a location that you will be most comfortable with. Go out in the water with your kayak and check from which part of the kayak you can easily grab a rod. Mark that place and set your rod holder in that part of the kayak. Yes, there are kayak thieves out there, waiting to steal your beloved kayak any minute. If you want to save your kayak from getting stolen, I suggest that you get kayak locks immediately. When you go on a long fishing trip, you can mount your kayak on the roof of your car and tie them together with these locks. These locks come in cable form and in straps while the strap buckles secure the kayak. These straps cannot be cut easily. When you store your kayak at home, use kayak locks to keep it from getting stolen. There are specific wall racks and wall hangers that you can use to store your kayak at home. If you’re unfamiliar with the region and fishing spot, your only option to get back to the coast safely is using a GPS system. Compasses are fine of course, but your compasses are nothing like GPS maps. GPS will give you a clear direction on where to go. A fishfinder accompanied by GPS system is the perfect way of locating possible fishing regions. These devices use sonar systems, which will allow you to detect the surroundings of the water you’re on. This can give you a rough idea of what is below your kayak, whether there are rocks, reefs, and fish nearby. Using your fishfinder and GPS system you can track your way back to the shore without damaging any reef systems or disturbing any school of dolphins. Bait tanks are needed to store live bait. Live bait usually move around a lot, so the bait tank must have a good balance and lower center of gravity. The style of the bait tank is completely your preference though. The bait tank could be a bucket or container that should fit in the kayak. For your own protection, you should always wear a personal flotation device, also known as a buoyancy aid. It is different from a life jacket. Life jackets cover the body from head to torso, but buoyancy aids cover from head to waist. They will not only allow you to stay afloat in adverse weather conditions, but they will also help you to stay warm while you are submerged in water. Using these is absolutely necessary, whenever you are using your kayak. Some come with pockets and other sealed compartments. A buoyancy aid can have multiple adjustable straps and buoyancy foam, which will give you a comfortable feel for a long period of time. When to Use a Kayak Rudder? Rudders are used to keep a kayak on a straight path. Wind and waves can turn your kayak around, but rudders can help prevent that. It usually lies at the stern of a kayak. Most kayaks do not need a rudder and it is simply used to save the extra effort of paddling. As long as you can paddle well, you’ll have enough control over your kayak. When you catch fish, you should be able to manage them well. Sometimes, you might end up getting squids or crabs. Collapsible traps are used to store crabs, shrimps, fish, and lobsters. They are pretty compact and take up less space in the kayak. They also have a handle that you can grip on to carry it around easily. Fish grips are used to hold a fish without hurting. It floats when you throw it on water and will also glow during night time! You will also need nets to catch fish if you see a school of fish nearby. Some nets come with flotation material inside which will allow it to stay afloat on water without having to keep an eye on it all the time. Kayak stabilizers are also known as outriggers. These are easily attachable as well as detachable. 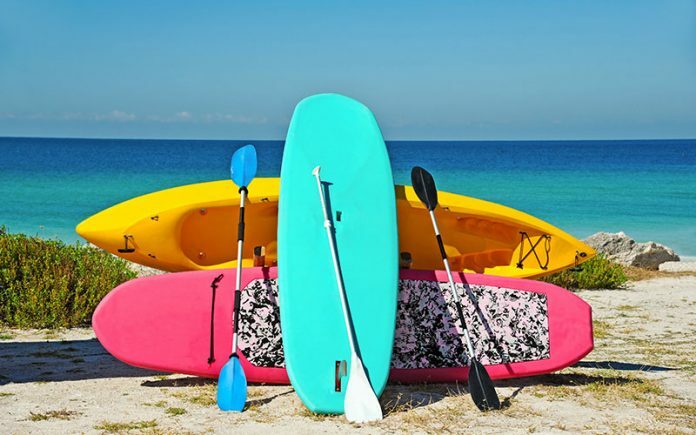 You should buy stabilizers that can be adjusted to all types of kayaks, including the inflatable ones. By attaching stabilizers, you can increase the buoyancy of the kayak and also include one more person in your kayak. Having to keep your legs in a similar position for long hours can hurt, so you can rest your legs on the outriggers to find some comfort. Outriggers will also allow you to help stand up and not fall over. With these kayak fishing accessories, your fishing experience will be both safe and easy. Although kayak trolleys are not always required, you might need them on some occasions. Usually, unlike canoes, kayaks are very lightweight so you can drag them around. However, dragging them around can give scratches so you can use trolleys. Place the kayak on trolleys and move them around with ease. Only buy kayak fishing accessories that you deem important. Some are must-haves, but depending on your budget you should buy extra accessories. Once you have all the gears, you should sail out into the oceans with your fishing kayak fully prepped for an adventure! Next articleHow to Score Fish in Ice with Tip-Ups: Follow These Tips!